One of the best things to happen this year has been the release of MASKS and MOBSTERS. 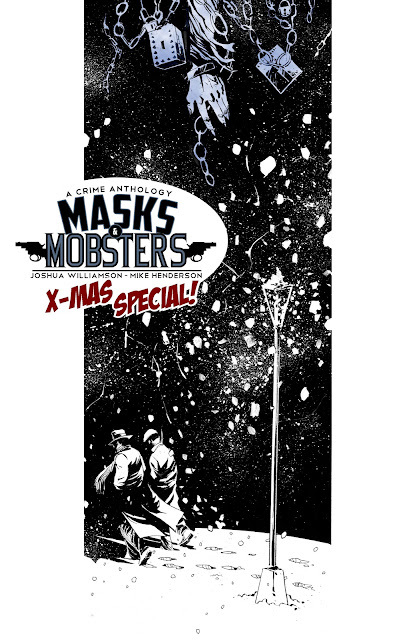 To celebrate and say thank you we have put together a special Holiday issue of Masks and Mobsters. It's our own take on a classic holiday story. It's one of my favorite stories of all time and I hope you appreciate our homage to it. All of the creative team proceeds from this issue will be donated to the Red Cross. We've had a good year when others haven't and wanted to give a gift to those who need it. Every thing that Mike and I make will go directing to the Red Cross. Mike and I knew that we wanted to do something special with the holiday issue. My original idea was to offer it for free, but Mike knew better and suggested that we donate the money to the Red Cross. I immediately knew Mike was right and started to set things up. This is not a promotional tool. Just our attempt at giving something back. Here is a link to the an interview about the issue. And of course a link to download the actual comics. I hope you enjoy it and have a wonderful Holiday season.